West London is to get its first Olympic-sized swimming pool for more than 40 years. Hillingdon Council has approved plans for a new £22m sports and leisure complex which will include a 50m pool and an athletics stadium. The London Development Agency (LDA) and Sport England have jointly funded the project, to be built in Uxbridge. 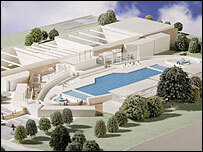 The new complex, which will also include a sports hall and fitness centre, is due to be completed in 2009. The new pool will include a movable floor, allowing for the space to be used as two 25m basins with changeable depths for different uses. The development is being built next to the 1930s Uxbridge open-air pool, a grade II-listed building, which is also being refurbished. Councillor Henry Higgins, from Hillingdon Council, said: "We are investing £22m into bringing the old Lido back to life as well as providing a new purpose-built 21st Century facility for our residents, which will be a legacy for our future generations - hopefully some Hillingdon Olympic champions. "With this additional funding we can enhance our plans and become one of the few places in London to have an Olympic-sized pool."